One parking space is available under the building which means no shoveling the car out after a big snow. One additional space is available outside the building. Spacious & luxurious two bedroom and two full bath condominium on the slopes in the Snowcrest condominium complex. 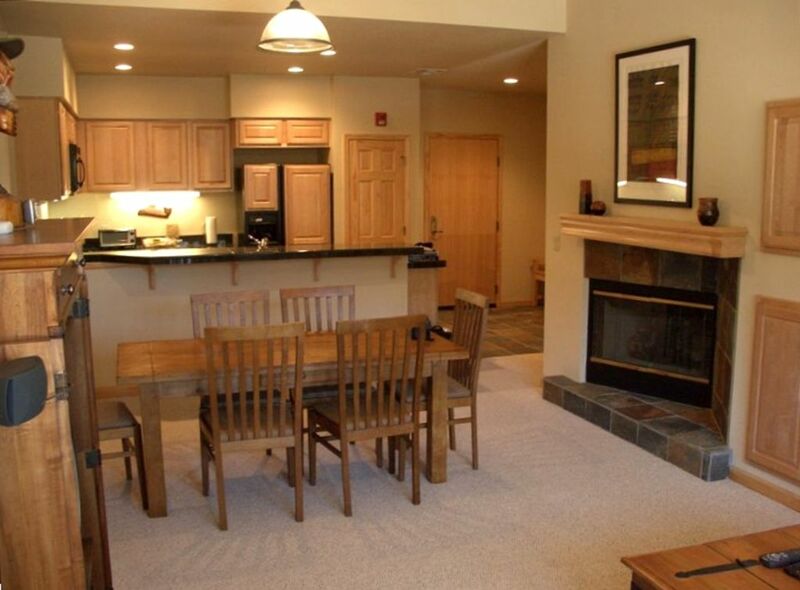 This is a true ski-in, ski-out condominium located about 100 feet from the chairlifts and about 100 yards from the main lodge area. The condo has many upgrades and amenities including huge windows, ten+ foot ceilings, small outside deck, gas fireplace, granite countertops and high speed wireless internet access. The living room has a 32 inch cable TV with DVD, VCR and game inputs, and the stereo is iPod capable. Each of the bedrooms is equipped with a cable television with built in DVD, VCR and game inputs. The condo has beds for six; the master bedroom has a queen bed and its own full bathroom. The second bedroom has two twins and the living room has a full sized sofa bed. The dining, casino's and action of South Lake Tahoe is approximately a 45 minute drive from Kirkwood. During the summer months, the chairlifts open to take hikers and bikers -- including their bikes -- to the top of the mountain. Enjoy the endless trails, views, wildlife, and solitude. Nearby Carson Pass is a great starting point for hikes to Meese Meadows, Frog Lake, Winnemucca Lake, and points beyond. Nicely furnished and well stocked condo on the mountain. Ann was very accomodating and communicated promptly as road closures leading up to our stay caused some concerns. Roads opened and all was good! Great location. Absolutely perfect ski-in/ski-out + superhost made for a wonderful stay!!! The place is really excellent, with covered parking, ski lockers, shared hot tub area, well-stocked kitchen and plenty of space for us and several friends to spend a long weekend. What really made it was the owner, who was super communicative, made sure we had everything we needed, and was flexible & understanding when we had some issues getting up to Kirkwood due to heavy snow and road closures. Would highly recommend staying here! This condo was great. All the furnishings and beds were comfortable, clean and well maintained. The covered parking is awesome, and the 2 minute walk to the main village was great. We didn't have to move our cars all weekend. The owner was super responsive and very accommodating - she even emailed me on the last day offering a late check out (without my even asking...). Cozy, comfortable, right on the slopes! Lovely condo. Clean, cozy, comfortable. Anne quickly responded to all my questions and gave us useful tips. Walk to the slopes, great restaurant for lunch nearby. Highly recommended! We found everything we needed for a lovely fall weekend stay. The instructions that Ann sent were very complete...so don’t forget to read the notes about the lockbox on the front door. This is the third time I have stayed and reviewed this property. I like to go in the summer and go hiking. Carson pass is 10 minutes away, and is my favorite hiking place in the Tahoe area. The rental is as advertised. Ann is great to deal with, she always responds quickly to my questions, and does what she can to help with our stay. Great place!